The bodies of Suraj (3) and Anil (9 months), who were killed by their father, Kamleshwar Paswan, on Saturday at Kishangarh Village, were buried today at the cremation ground situated along the Sukhna choe. The UT Administrator today virtually acknowledged that there was something wrong in the allotment of a piece of prime land to a private company run by influential persons in Sector 38A for the construction of a law college. 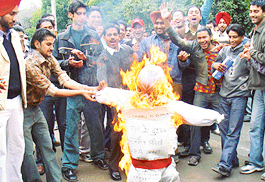 Even before a thorough enquiry is conducted into the lapses which led to the re-evaluation of answer-sheets of a cancelled paper of M Sc (mathematics), accountability-shy Panjab University has found a “convenient” scapegoat in a storekeeper responsible for handing over and storage of answer-sheets. Despite plethora of tests conducted to ensure the safety of donated blood, the threat of the HIV may still persist, especially if the donor has donated blood in the window period, when his disease status is not known. At least Rs 4 lakh worth of goggles, $ 3000 and Rs 1.55 lakh in Indian currency and gold were stolen in the spate of thefts in the city since yesterday. The police today claimed to have busted a gang of car thieves, involved in stealing cars here, preparing forged documents and selling them. As many as nine cars, valued at Rs 30 lakh, have been recovered. All preparations of the Punjab Urban Planning and Development Authority (PUDA) for the removal of encroachments in Kumbra village came to a halt with the Punjab and Haryana High Court giving a stay in this regard. Residents of Kumbra village stand in front of a JCB to stop the PUDA move to remove encroachments; and right police personnel and municipal council staff of Mohali go back from Kumbra village after the Punjab and Haryana High Court stayed the demolition drive on Monday. HER love for abandoned creatures is unfailing. Heart-wrenching howls of a dog in distress or a puppy in pain in this bone0ratting chill can give her sleepless nights. A famished fowl or a grievously wounded cow or a calf touches the chords of her psyche. The January chill seems to have set in with a significant fall in the day temperature coupled with light showers in the city today. And with several parts of Himachal Pradesh, including Shimla, witnessing showfall, cold wave-like conditions prevailed in the city and the adjoining areas by the evening. Sharing concern for the cause of rehabilitation of tsunami-hit people, the president at Gurdwara Patshahi Dasween, Sector 8-C, Chandigarh, Mr Harbans Singh, accompanied by Mr B.B. Behl, president Chandigarh Territorial Congress, Lt-Col. Mahinder Singh and Mr Chandan Singh presented cheques for Rs 3.02 lakh to the UT Administrator, Gen S.F. Rodrigues (retd), as a contribution towards the Prime Minister’s National Relief Fund. 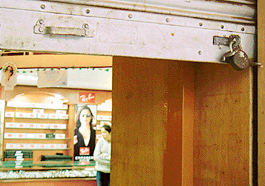 Mr Joginder Singh, an income tax payer and a Sector 17 shopkeeper, is a harassed man. Even after receiving a refund order from the Income Tax Department several days back, Mr Joginder Singh is yet to get his refund. Acts of uncommon courage in saving human lives are never done in anticipation of any social appreciation. However, an award for an act of bravery, social or physical, can be inspiration for someone else also who could also save a life. The Centre for Development of Advanced Computing (CDAC) organised a four-week specialised training programme for chief information officers of the Punjab Government in collaboration with the Department of Information Technology, Punjab. The programme on “Planning implementation and management of e-governance projects” was inaugurated by Mr J.S. Bhatia, Director, CDAC. 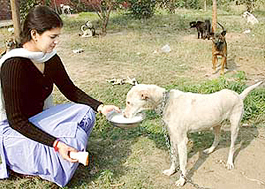 Dr R. M. Sharma has been chosen as the president of the Society for Prevention of Cruelty to Animals (SPCA), Mohali. Dr R.K. Arora would be the senior vice-president while Dr Kanwarjit Singh would be the honorary general secretary. About 25 years ago, Lieut-Colonels used to command battalions and regiments and Majors were their second-in-command. The AOC, 3 BRD, Chandigarh, Air Cmde S.P.S. Virk, presents ‘Vital Trophy’ to the depot coaches. The Superintendent of Police, Mr S.P. Ranga, today said the police would guard houses, if the owners informed the nearest police station, before going out of station. A sewing centre was inaugurated by the SDM, Mohali, at Dashmesh Khalsa Public Senior Secondary School, Phase 3B1, Mohali. No fee would be charged from those who come to the school to learn sewing. Prajapita Brahma Kumaris Ishwariya Vishwa Vidyalaya will celebrate the World Peace Day in connection with the 36th Ascension Day of the founding-father Prajapita Brahma tomorrow. A resident of Dappar village sustained head injuries when he was reportedly assaulted by his brother-in-law on his objection to the letter’s behaviour with his sister at his house, near here, this noon. 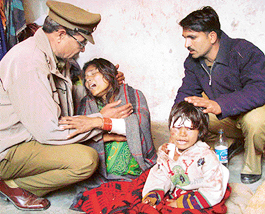 Mystery shrouds the death of 25-year-old Simran at Barwala today morning. The family says that she was suffering from a breathing disorder and died today. She was brought to the General Hospital where she was declared dead. The police has initiated inquest proceedings. The Punjab and Haryana High Court today adjourned till tomorrow the hearing in the case involving Bar Council of Punjab and Haryana Chairman C.M. Munjal. Payal Rohatgi is poised and sounds confident as she begins talking about herself. For those, who do not know her, here goes the introduction. Payal is an actress who made her entry into Bollywood with the film ‘Yeh Kya Ho Raha Hai’. She also made her mark in the industry by playing the character of a snooty girl called Ishaa in this film. If you have ever hummed “Excuse me kaya re mera dil tujhpe fida re”, a hit song from the film ‘Style’, then you won’t take a minute to recognise Sahil Khan. With coloured hair, he sports the Western look, but that is because the movie sequence demands it. “Music is a universal medium for communicating ethical essence of love, peace and mutual harmony as its appeal transcends all barriers of caste, creed and national boundaries of humanity,” opined Stan, the lead guitarist and singer of world-acclaimed rock band of France. 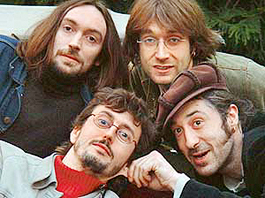 Artistes of leading French rock band ‘Matmatah’ in Chandigarh on Monday. He is introvert and doesn’t open up easily but he succeeds in leaving an impression on you. Model-turned-actor Jatin Grewal is an alumnus of DAV College and he recalls the days he spent in the city. 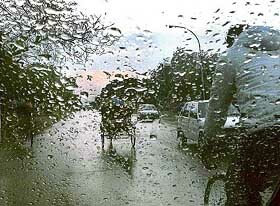 “I visit Chandigarh whenever possible. I remember I ate a lot of ‘Aloo ke praanthe’ in the canteen and used to go on the ‘geri route’ on the bike”, he says. To give a boost to ambulance services in the city, the UT Red Cross Society has signed a memorandum of understanding with various non -governmental organisations (NGOs) today to provide better and uniform services to the residents. The Director, PGI, Prof K.K. Talwar, honoured the philanthropists for generously donating towards the purchase of equipment for the Department of Neurology here today. As many as 250 villagers, including children and aged, attended a medical check-up camp organised by Punjab National Bank (PNB) in association with HelpAge India at Maloya village. It was inaugurated by Mr B.P. Chopra, General Manager, PNB, North Zone. 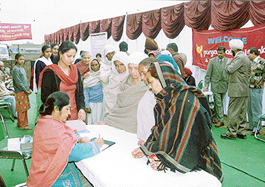 Women being examined at a medical camp organised by Punjab National Bank and HelpAge India at Maloya village in Chandigarh on Monday. In the first semifinal of the Satluj Challenged Cricket League played at Panchkula, Umesh Kaira’s unbeaten ton helped Satluj Cricket Coaching Centre beat New Model School by 112 runs. Umesh was supported by Karandeep Singh, who scored 73. The calendar of the Ball Badminton Federation of India for the 2005-06 season was approved at the AGM of the federation in Hyderabad, recently. Seeking advice from the Attorney General of India, Mr Milon Banerjee, the Chandigarh Administration today shot off a letter to him detailing the controversy arisen out of the allotment of land to the Law Institute in Sector 38-A here. Following a decision of the Chandigarh Administration, the term of the all important Finance and Contract Committee (F&CC) of the Municipal Corporation shall be for five years and not one year. The local Municipal Council has requested the Punjab Urban Planning and Development Authority (PUDA) to construct a wall outside the Jhotekut Colony in Sector 71 here. Ms SK Aulakh today took over as the Chief Commissioner of Income Tax, North Western Region, here.